Atypical teratoid rhabdoid tumor (ATRT) is a rare neoplasm of childhood. Most common location of this tumor is infratentorial. Supratentorial ATRT is an uncommon occurrence. We present the imaging findings of a supratentorial ATRT in a child. 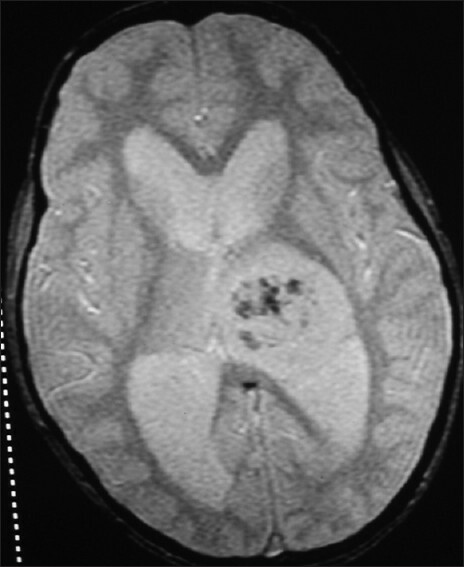 A 5-year-old girl presented to the pediatric casualty with sudden onset of headache and vomiting since last 15 days. She also developed right hemiparesis and deterioration of vision of right eye since last 5 days. Magnetic resonance imaging (MRI) of the brain revealed a large mass in left thalamic region with foci of hemorrhages and hydrocephalus due to mass effect on the third ventricle [Figure 1],[Figure 2],[Figure 3]. She underwent near total excision of the mass by transcortical transventricular approach under image guidance. On histopathology, the mass was diagnosed to be atypical teratoid rhabdoid tumor WHO grade IV. Six months follow-up imaging revealed no tumor recurrence. ATRT of the CNS has been recognized as a distinct disease entity as recently as in 1987. Usual presentation is in the children of age group below 2 years. Most commonly (two-third cases), the tumor is located in posterior cranial fossa,  the common locations being cerebellopontine angle cistern and cerebellar hemispheres. Supratentorial location is relatively less common, though an incidence of 47% has been reported in some case series. Supratentorial locations include the suprasellar, pineal and temporal locations. The age group of purely supratentorial tumors is higher compared to that of infratentorial tumors. Clinical presentation is usually nonspecific and depends on the tumor location and age of the child. Congenital tumors may present with macrocrania. The tumor usually has a rapid progression; having an average survival of 6-11 months. 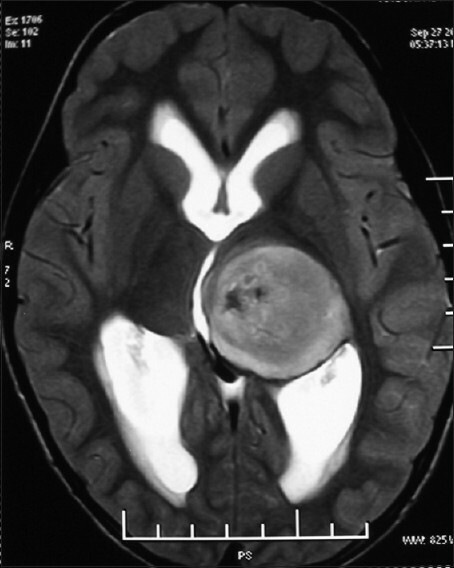 The lesions are hyperdense on imaging and heterogeneous on non-contrast magnetic resonance imaging (MRI) having areas of hemorrhage, necrosis and calcification, and show heterogeneous contrast enhancement. On T2W images, the tumor is isointense to hypointense to gray matter, owing to high nuclear-cytoplasmic ratio. Leptomeningeal spread of tumor is observed in one-third of the cases. There is no significant difference in imaging or prognosis in supratentorial and infratentorial tumors. 1. Lefkowitz IB, Rorke JB, Packer R, Sutton LN, Siegel KR, Katnick RJ. Atypical teratoid tumor of infancy: Definition of an entity. Ann Neurol 1987;22:448-9. 2. Oka H, Scheithauer BW. Clinicopathological characteristics of atypical teratoid/rhabdoid tumor. Neurol Med Chir 1999;39:510-7. 3. Meyers SP, Khademian ZP, Biegel JA, Chuang SH, Korones DN, Zimmerman RA. Primary intracranial atypical teratoid/rhabdoid tumors of infancy and childhood: MRI features and patient outcomes. AJNR Am J Neuroradiol 2006;27:962-71. 4. Warmuth-Metz M, Bison B, Dannemann-Stern E, Kortmann R, Rutkowski S, Pietsch T. CT and MR imaging in atypical teratoid/rhabdoid tumors of the central neurous system. Neuroradiology 2008;50:447-52. 5. Parwani AV, Stelow EB, Pambuccian SE, Burger PC, Ali SZ. Atypical teratoid /rhabdoid tumor of the brain: Cytopathologic characteristics and differential diagnosis. Cancer Cytopathol 2005;105:65-70. 6. Ho DM, Hsu C, Wong T, Ting LT, Chiang H. Atypical teratoid/rhabdoid tumor of the central nervous system: A comparison with primitive neuroectodermal tumor/medulloblastoma. Acta Neuropathol 2000;99:482-8. 7. Koral K, Gargan L, Bowers DC, Gimi B, Timmons CF, Weprin B, et al. Imaging characteristics of atypical teratoid-rhabdoid tumor in children compared with medulloblastoma. AJR Am J Radiol 2008;190:809-14. 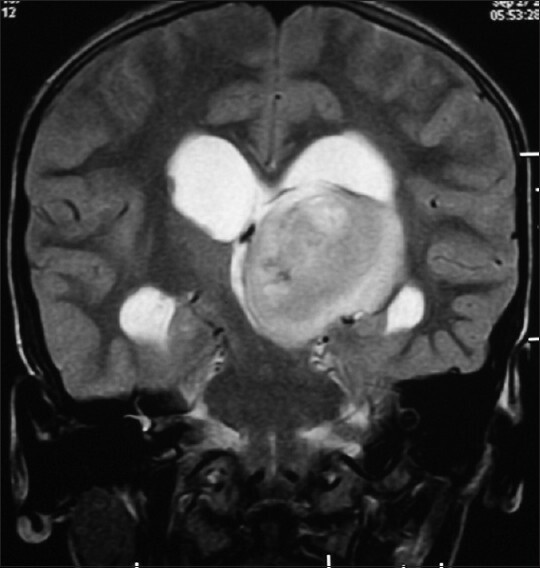 1 How specific is the MRI appearance of supratentorial atypical teratoid rhabdoid tumors? Au Yong, K.J. and Jaremko, J.L. and Jans, L. and Bhargava, R. and Coleman, L.T. and Mehta, V. and Ditchfield, M.R.